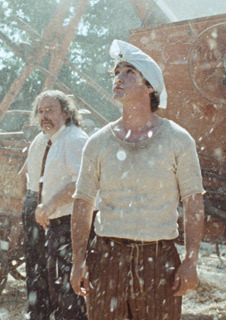 This is the tale of a meeting between Lazzaro, a young peasant so good that he is often mistaken for simple-minded, and Tancredi, a young nobleman cursed by his imagination. Life in their isolated pastoral village Inviolata is dominated by the terrible Marchesa ­­Alfonsina ­de ­Luna,­ the­ queen­ of­­ cigarettes.­ A loyal bond is sealed when Tancredi asks Lazzaro to help him orchestrate his own kidnapping. This strange and improbable alliance is a revelation for Lazzaro. A friendship so precious that it will travel in time and transport Lazzaro in search of Tancredi. His first­ time ­in­ the ­big­ city,­ Lazzaro ­is ­like­ a ­fragment­ of the past lost in the modern world.